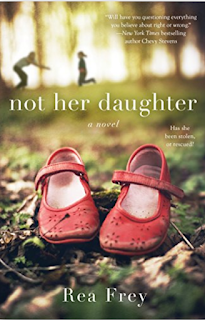 The first chapter of NOT HER DAUGHTER is taut, intense, gripping – and by the end of its handful of pages, it’s clear the speaker, entrepreneur and CEO Sarah Walker, has taken someone else’s child: Emma Grace, an adorable and smart little girl in a red dress who’s been routinely, casually, physically and emotionally abused by her mother (and ignored by her father). Is there any way this can be right? 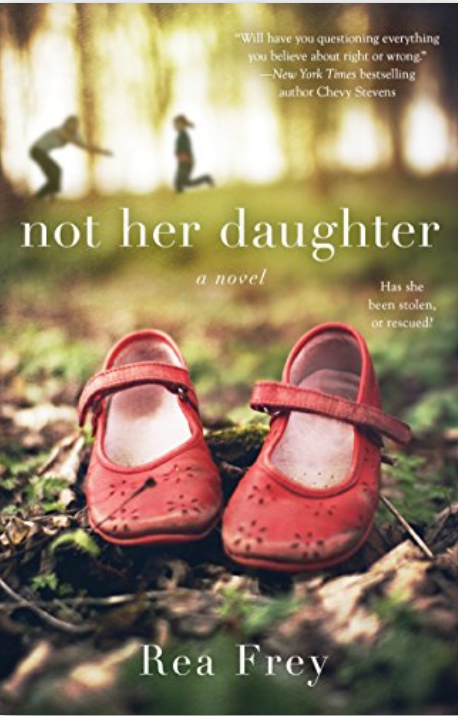 Has Sarah become a kidnapper, a criminal, a runaway from her own life—for the sake of rescuing a child who reminds her far too clearly of her own abandonment? Sarah’s probably the last person you’d imagine as a kidnapper. Her loyal and caring employees at her firm, which provides educational materials for schools in the US and abroad, call her “Boss Lady” to her face, and do all they can to make her high-stress, hard-work life a little smoother and sweeter. Her aging dad counts on her support. Her mother—well, she walked out when Sarah was a small child. And Sarah’s boyfriend just took off recently. Traumas, or clarity? She closes the gap and looks up at me. My hand is still extended. She studies it, arms at her sides. I manage a smile and secure my lips against my teeth. ‘I just want to help you,’ I say. I am going to take you away from here. She takes another breath. Her whole body balloons and then deflates. She bends the fingers of her left hand, then lifts her right hand toward mine. It makes contact. I squeeze and press her hot palm to mine. Our bodies link. Our eyes lock. She nods, and my voice catches in my throat as I begin to pull her away from her mother, her house, and her life. Rea Frey lives in Nashville and has a daughter (with her husband). She’s been co-owner of a gym in the past. Her previous books have been nonfiction—on detoxing before pregnancy, vegan eating, cheating boyfriends—and this is her debut in fiction. It’s a high-suspense crime novel, well paced and smoothly written. The ending raises multiple questions, and is a little too rushed to do them justice. Probably the most interesting aspect of NOT MY DAUGHTER is the urge to identify with Sarah, who clearly is guilty of a horrifying crime. Of course, from her point of view, she’s a rescuer, taking action that the social welfare system won’t. Also intriguing are the segments from the point of view of Emma’s mother, the woman who gave birth to her and in most ways hates her. That abuse is real; there are reasons for it, but of course, no possible justification. Book-club questions wrap up the novel. It could be fascinating to listen to discussions from other women, moms and aunts and grandmothers, who’ve imagined saving a child this way. Would you do it? Rea Frey’s most pointed question may be: Whose daughter is Emma, really? A note about this unusual author: Frey gave herself an 8-week window to write this book. Not only did she complete it (in a month), but her manuscript ended up in a bidding war among publishers, and she received a two-book contract. So, expect another gripping crime novel from her, in a year or so. Dr. Siri Paiboun has retired from his Party-required position as national coroner of Laos (1980s style). That gives him plenty of time to spend with his wife, Madame Daeng, assisting at her noodle shop -- except somehow he's pretty often away on adventures instead. As DON'T EAT ME (number 13 in this highly entertaining international caper series) opens, Dr. Siri and his good friend Civilai -- Comrade Civilai, that is -- have smuggled a large, bulky item home on a raft. And the next morning brings them a regrettable visit from their friend Inspector Phosy, who has not retired and therefore needs to confront them with presumably smuggling a weapon into the People's Democratic Republic of Laos. The good part is, it's not a weapon -- it's an enormous electrical movie camera, for the friends' ambitious notion to create a Laotian version of War and Peace on screen. Starring, of course, handsome young men like themselves (okay, like they Once Were). "How do we develop the film?" Civilai asked. "Old Brother," he said, "on the eve of the race does the marathon runner worry about what drinks will be available at the winner's reception party? No. He takes one step at a time." Once Phosy realizes he doesn't have to arrest his buddies, everyone relaxes. Which in turn leaves time to comtemplate the challenges for their plan: No power to run the machine. No operating manual. An interfering sort of local bureaucracy that's likely to rewrite the script for its own members, if it gives a shooting permit at all. And, oh yes, complications in the family circle, related to Mr. Geung. Readers of the series will leap at the notion of hearing more about Mr. Geung's life, especially his planned marriage (!). If you haven't read any of the earlier books, be warned: You need to abandon disbelief, go with the flow, and let Dr. Siri and Mr. Geung demonstrate the fine points of the Laotian spirit world, where each of them keeps connecting. But there's more to DON'T EAT ME than the madcap adventures of these rebels! There is, of course, a crime ... perhaps two or three? ... a skeleton (not yet bare) ... a criminal enterprise involving animal smuggling ... and conflict with the "real" bureaucracy. Cotterill's passion for clever and unexpected twists that show the Party at its manipulative worst (and of course Dr. Siri fumbling his way toward a solution that his friends will help implement) takes the plot to drastic extremes this time. It felt like a lot of chapters spent wondering whether the team would ever be able to restore its usual lives -- and feeling highly anxious about missing family members! Colin Cotterill's Dr. Siri books are always a delight. 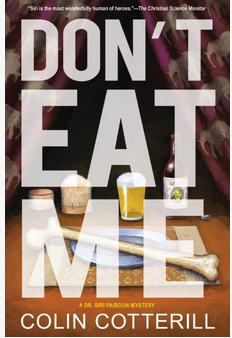 DON'T EAT ME may be one of the most memorable in the series. And it's almost sure to send you back to the earlier titles, whether for the first time or the third (or more). Good fun, and a great summer read, from Soho Crime (an imprint of Soho Press). What are the keys to a serial killer crime novel well worth reading? 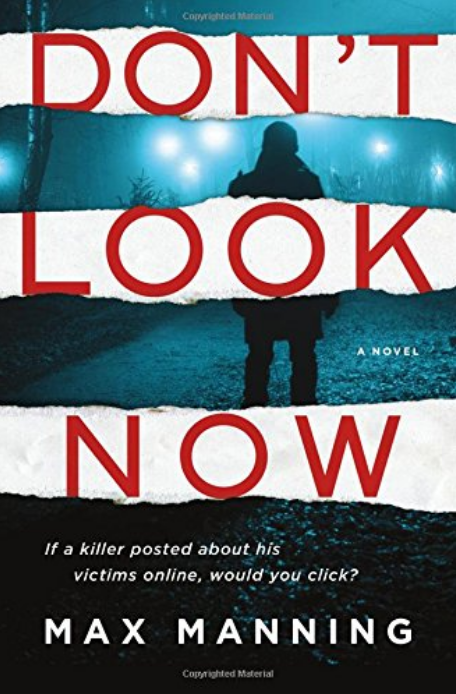 Max Manning, a seasoned British journalist who’s covered crime and more for London’s big newspapers, crafts a modern “Jack the Ripper” in Don’t Look Now and takes readers along with the killer on a journey of multiple killings. But in spite of direct glimpses of this nightmare’s thinking process, there’s no expectation of liking or even fully understanding the criminal here. Instead, Manning binds readers to the very different lives of two men who will risk losing everything, for the sake of ending this crime spree. One is Detective Chief Inspector Dan Fenton, who’s caught in a political net that won’t give him time to solve the crime, as the newspapers ramp up their pressure on his officers, on him, on New Scotland Yard. Suddenly a single parent, with a school-age daughter and a huge grieving hole blasted by his wife’s death from cancer, Fenton still needs to work overtime, maybe double, to clear the case that keeps growing with each new death. Yet each time he breaks a promise to be home “soon” for his daughter or their new live-in nanny, he’s tormented. Yes, that kind of person, the kind who really cares about respect for others, kindness, obligations. How on earth can that kind of person survive a police bureaucracy? Then there’s Adam Blake. At first, we only know he’s taking really hard the first murder. It’s the woman who’d been his girlfriend until a few weeks before, when she’d given up on him, especially his unwillingness (as she saw it) to get help for the frozen parts of his soul, massive remnants of an inner and outer wound that wasn’t his fault. But isn’t healing. It’s clear his friend Lauren Bishop was a random choice for the killer. Is there some reason Blake should turn back toward the broken relationship now, after this murder, and help seek the killer? Those are the factors that Manning handles with enormous skill: keeping the suspense and danger frighteningly intense, while murders pile up and Fenton takes a public shaming for being unable to stop them, Blake struggles to function within “civilization” after his exiling, and pain shows itself in even the smallest gestures. Fenton is rubbing his eyes red; Blake might as well be sweating tears, as he chases a hacker who might be able to help. And that’s where the “modern” aspect of this serial killing plays out. The killer—readers know him only as @IKiller, from his Instagram account and other social media plays—has the same craving for public fame that the Ripper probably shared. But he’s tackling it through the most modern processes of publicizing cellphone photos of his victims before and after killing. London’s terrorized by the literal faces of terror and death. And by a disgusting fascination that emerges in the seams of the city. Dark and focused on three men’s choices—those of Blake, Fenton, and the killer—Don’t Look Now uses the women in this story (the deceased girlfriend; her surviving sister; Fenton’s daughter) as measures of how much the crime solvers care. When their lives fall apart, will they be of any use to each other in stopping the killing?